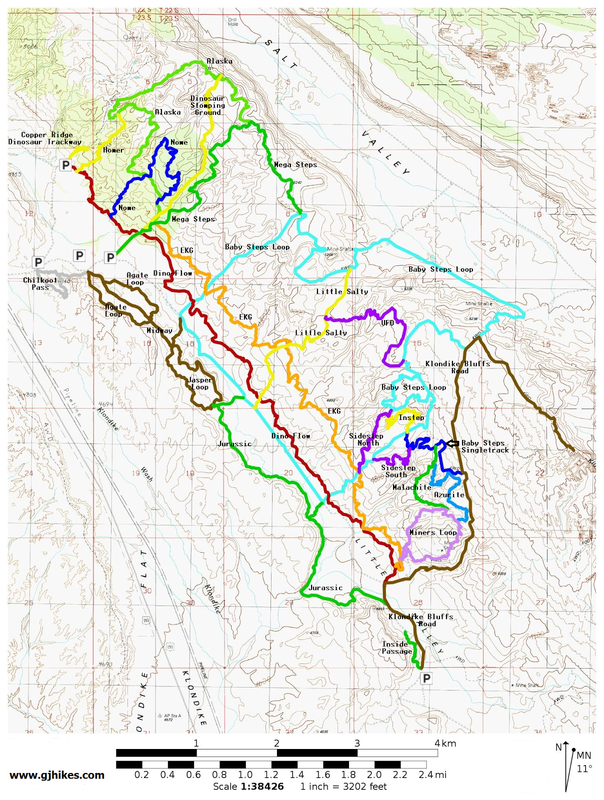 The Alaska trail is in the Klondike Bluffs Area north of Moab, Utah. The trail begins off of the Mega Steps trail, near the lower area of the bluffs, and travels north working its way through various upper valleys eventually climbing to the east ridge that overlooks the Salt Valley. From there it travels south along the ridge until it reconnects with the Mega Steps trail and comes to an end. The Alaska trail by itself is only about 4 miles one-way. For this post we took advantage of the Mega Steps trail to create a 6.6 mile loop. The parking area of choice for this post was the Mega Steps trailhead. 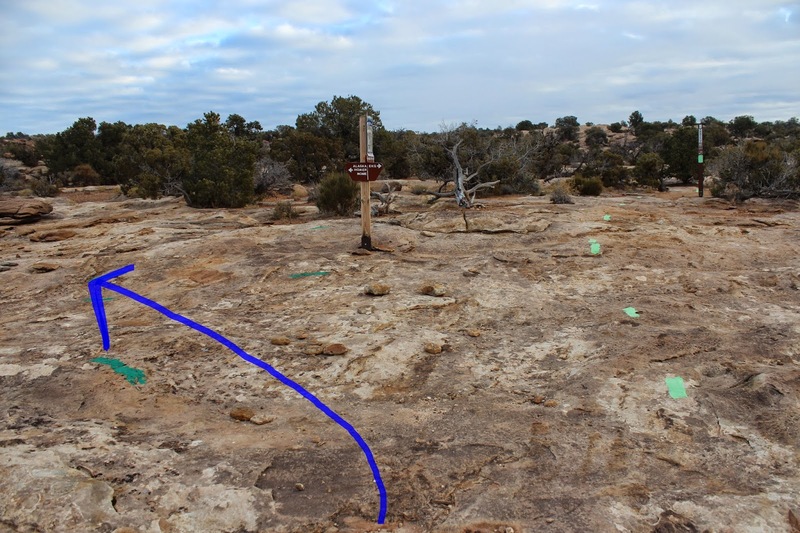 To get there either drive 23 miles north from Moab or about 9 miles south from the Crescent Junction exit on Interstate 70 and turn east at the North Klondike Bluff sign. Cross the railroad tracks and follow the dirt road for just over 1 mile to a fork in the road. 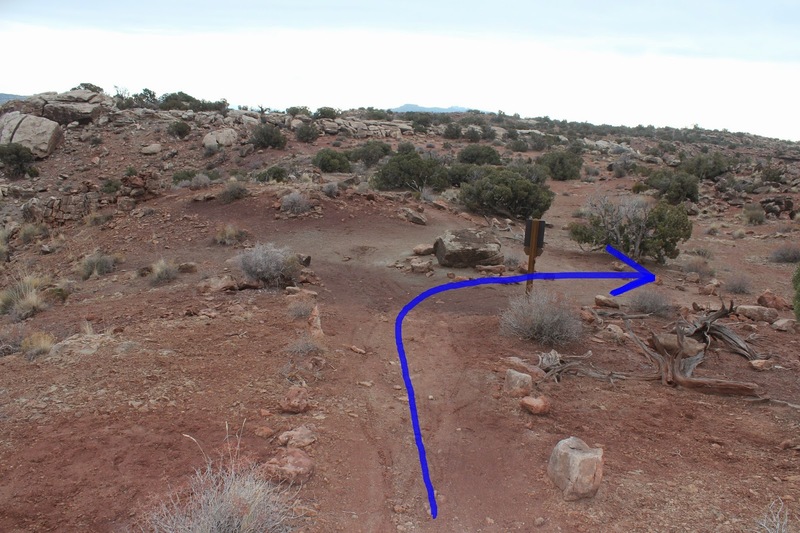 The left fork leads to the Copper Ridge Dinosaur Trackway where there is an outdoor privy, and the right fork leads to the Mega Steps trailhead. The dirt road has enough rock in it that it stands up pretty well in wet weather but there are a few spots that are impassable for passenger cars if it gets too wet. The trail departs near the kiosk and crosses the flats heading toward the bluffs. After a short distance the trail drops down a small hill to a wash where it meets the Dino-Flow trail. Taking the right fork of the Dino-Flow trail for about 100 feet leads to its junction with the Mega Steps and Dinosaur Stomping Ground trails. The Mega Steps trail is marked with light green stripes of paint. The trail picks a relatively easy route as it climbs the uneven slickrock. Measuring from the parking area the Alaska trail begins at the 0.51 mile point. The Alaska trail barely gets started when it is intersected by the route to the Dinosaur Stomping Ground. It's next encounter is with the exit side of the Nome trail. Most of the elevation gains are pretty minor as the Alaska trail cuts its path across the bluffs. Just under the 1 mile point from the trailhead the Alaska trail is intersected once again by the Nome trail. The Nome trail begins off of Dino-Flow, climbs the hillside to the Alaska trail, and begins a loop that takes it above the Dinosaur Stomping Ground and then back to the Alaska trail at the spot where we pointed out its exit. The next 1.25 miles is pretty easy riding. The trail continues north following washes and crossing small ridges gaining a little bit of elevation as it goes. At the 2.25 mile point from the trailhead the Alaska trail is met by the Homer trail that also comes up from the Dino-Flow trail. This spot is where the Homer trail comes to an end. After passing the Homer junction the Alaska trail begins climbing at a greater pace as it turns more easterly and heads toward its high point along the ridge above the Salt Valley. Distant views of the area in the direction of Canyonlands, around Merrimac and Monitor buttes, are mesmerizing even on a hazy day. At the 3.4 mile point the Alaska trail reaches the top of the ridge and begins traversing its way back toward the south. The views of the Salt Valley with Arches National Park in the background are excellent. Continuing along the ridge to the 3.7 mile point the trail is met by the upper end of the Dinosaur Stomping Ground trail. 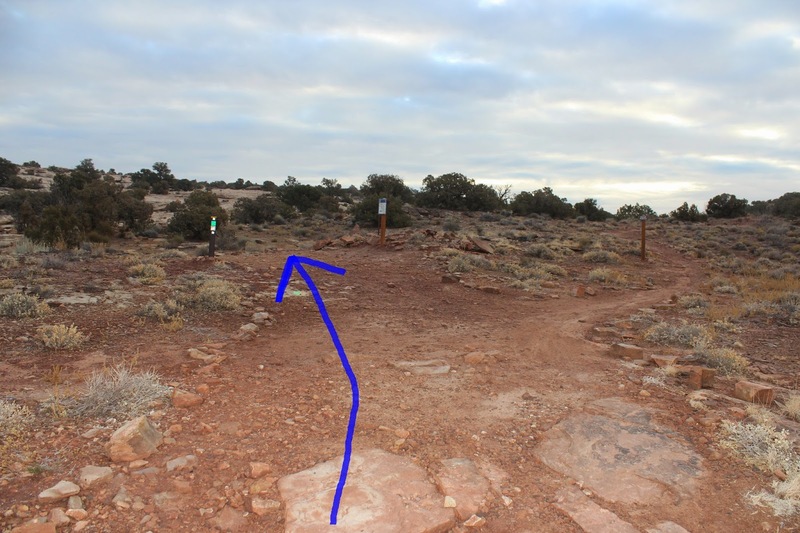 That trail is open only to hiking but it is only a couple tenths of a mile, or a five minute walk, down to the first area of tracks. The Alaska trail meets up once again with the Mega Steps trail just under the 4.5 mile point and this is where it comes to an end. From here you can continue along the ridge on Mega Steps and head back down on one of the other trails like North Baby Steps or do as we did and roll down the mountain back to the trailhead. The ride down Mega Steps begins with a lot of hard packed dirt but changes to mostly slickrock when it breaks over the ridge. We completed the outing for this post during the winter month of January. The sky was a little gloomy but the trail was in great shape with the temperature ranging in the lower 40's F. Some years have more snow than others but the bluffs melt of pretty quick and if you can get to the trailhead you can probably find a good trail to hike or ride. Winter time seems appropriate anyway for a trail named Alaska. If you would like to see it for yourself then all you have to do is grab your bike or 'Take a hike'.